The shape of the face differs from one person to the other. So the hair style that suits one face shape may not look good on another person having a different face shape. The best is to consult your hairdresser and know what hair style suits you the best. However, there are some hair styles which, with some little changes, can suit any face shape. So, here we will discuss about some hair styles that suit different face shapes. Layers look good on all face shapes. So, anyone can try this hairstyle. If you have a round face you may have the layers start around your chin as this will make your face look longer. If you have a long face, you may start the layers much higher, may be around the cheekbones. This will add more width to your face and makes it appear less long. A razored, textured cut is ideal for long face. For those who have a square face, the layers must start a little below the cheeks. This will add softness to your strong and square jaw. This hairstyle is for the smarter women, who are daring enough to make their hair really short. You can cut it depending on the shape of your face. If you have a round shaped face, you need a little height on the pixie cut. Tall layered cut will make your face appear longer than it is. 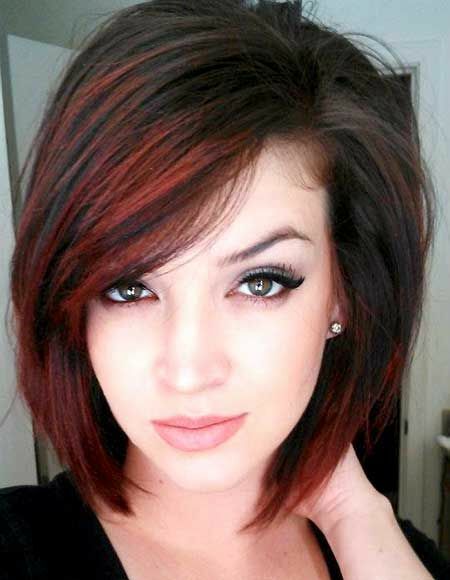 If you have a long face, pull off this cut with side swept short bangs. For oval shaped face, you can choose any style with pixie cut. If your face is heart shaped, side swept bangs that are long will be the best. This will balance the angular features of your face. For square shaped face, all you have to do is to make the pixie cut look soft instead of spiky. This way you will look fabulous. Side swept bangs look good on most of the face shapes. If you have a heart shaped face, they change your attention from the tapered chin. The square face is made soft with bang hair style. If you have a round face, they add dimension to the face and make your face look less rounded. For long face, you have to stick to blunt bangs above the brows. This will provide width to your face and make your face appear less long. If you want a shorter hair, then bob cut is a good choice for you. The bob cut can be molded according to the shape of your face. An asymmetric fringe to the bob cut will make long face less long and add width to your face. If you have a wide forehead or a square face, a deep sided parting is enough to cover them up. For long faces, curling the sides and back of the hair will look good. This type of hairstyle is neither too long nor too short. The hair reaches right up to your shoulder. This type of hairstyle looks good on all face shapes. If you are working in an office try medium cut hair with layers. This will look good on you. Medium cut hair style that is flipped out is excellent for long faces and makes the face look wider. If you have a square face, soft curls with side swept fringe is a good option. This will soften the sharp contours of your face and makes it appear less square. For a round face, medium cut hair worn straight will look best. This will make your face less rounded. Razor cut edges also help in making the features soft. So, if you are confused as to which hairstyle will look good on you, choose one of the five hairstyles mentioned above and cut your hair according to the shape of your face. This will make you look stunning no matter what shape your face is. They look good on all face shapes. There are different hairstyles like short, wavy, long, curls, straight and so on. But you have to choose the hairstyle that suits your face. If not, you will end up looking not as good as you have expected. Here are a few haircuts that that suit different face shapes. If you have a diamond shaped face, you can try any haircut and look great in it. Long and medium length with side bangs and chin length bob cut are some of the best options for you. Soft rounded haircuts will take the attention off the angular features of the face. A heart shaped face will look beautiful with wavy long layers. If you want it short, you can try bob cut with layers that reach up to the chin. Angular bob will also good on heart shaped face. If you have a long face, try to make your face look shorter and more rounded by going for short cuts. Long and flat hair will make your face all the more longer. If you prefer long hair, soft add curls, fringes and bangs to get the fabulous look. If you have an oval face, you are really lucky because all haircuts look good on oval faces. If you have a round face, don’t do short bob cuts as they will make your face look rounder. You can choose shoulder length cut and even longer haircuts. Straight hair cuts or soft curls look really pretty for round faces. Square shape face has a prominent jaw line. So you can keep your hair long, straight or with soft curls. If you want your hair to be short, go for bob cut, layered or with soft curls. Straight blunt bob will not look good on square face because it will highlight your jaw line. You can even try pixie cut.